During a transfixing moment of the New York Philharmonic’s starkly dramatic staged performance of Honegger’s great French oratorio “Joan of Arc at the Stake” on Wednesday night, the superb actressMarion Cotillard, as Joan, a spoken role, stepped haltingly across a walkway extending past the orchestra into the auditorium. At first she looked dazed and distracted. Was Joan absorbed with spiritual reverie? Hearing heavenly voices again? Or out of her mind? It seemed eerily unclear. The impressive singers of New York Choral Artists, standing in tiered rows behind the orchestra wearing plain robes, sang scattered phrases suggesting the voices of Heaven that Joan claimed to hear all her life. The orchestra played Honegger’s curiously ambiguous music: harmonically veiled, wondrously understated, intriguingly scored for an orchestra including saxophones, myriad percussion and ondes martenot. Once again, this was not a typical subscription-series program at the Philharmonic. Since arriving as the orchestra’s music director in 2009, Alan Gilbert has given audiences many adventurous nights like this one. Starting that first season with an audaciously theatrical staged performance of Ligeti’s bleakly satirical opera “Le Grand Macabre,” directed by Doug Fitch, Mr. Gilbert has shown several times that the dully conventional Avery Fisher Hall could be turned into an effective space for opera. This “Joan of Arc” was not a Philharmonic project, but the American premiere of a production by the director Côme de Bellescize created in 2012 for the Seiji Ozawa Saito Kinen Festival in Japan. Still, this “Joan” represents another Gilbert milestone. The production makes a strong case for this 80-minute oratorio’s power as a staged drama. It was written in 1935, though an agitprop prologue was added in 1944, adapting words from Genesis about darkness descending upon a divided kingdom, to suggest support for the liberation of France from Nazi occupation. Honegger persuaded the French writer and diplomat Paul Claudel to provide a libretto. The historical Joan remains an elusive figure, a 15th-century peasant girl who, placing trust in her heavenly visions, took up a sword at a time of division within France and was eventually tried for heresy and executed. In their oratorio Honegger and Claudel focus on Joan as an innocent, a searching young woman who radiates love for God and country, seemingly blithe about the horror of war, yet terrified of pain and death. The text, the confrontations portrayed and, especially, Honegger’s subtle music capture this Joan’s ambiguities. After the introduction, Joan imagines a counselor appearing to her — Brother Dominique, another spoken role, here the actor Éric Génovèse, who exudes trustworthy calm. He has come with a book he has kept, the story of her life. In a wrenching moment, Ms. Cotillard’s Joan shudders with fear, explaining that she has long been surrounded by men wielding pens, judging her. But the book becomes the way Joan, assisted by the brother, looks back at her life. Honegger, born in France to Swiss parents, drew more from the German than the French musical heritage. Still, in its refinement and elegance the music of this oratorio seems Gallic, tinted with Ravel, even the soft-spoken Satie. Yet “Joan of Arc” has episodes of harrowing intensity. During feverish choral episodes, when crowds call for Joan to be burned, Honegger’s music, without resorting to cinematic excess, suggests the gaggle of voices that engulfed her. Threatened clerics denounce her as a heretic, backed by compliant common folk. The most chilling voices come from fanatical citizens who sing almost heavenly phrases, convinced that burning will liberate Joan’s soul. Mr. de Bellescize takes the metaphorical elements of the work at face value. Joan’s trial becomes a circus, with the orchestra and chorus breaking into raucous band music, a scene abuzz with clowns and animals, including a pig serving as judge, all costumed imaginatively by Colombe Lauriot Prévost. The members of the Brooklyn Youth Chorus (Dianne Berkun-Menaker, director), models as always of musical and dramatic confidence, appear as sheep, little beasts, they’re called, to cheer on the trial. They return later as children in comic-book bright shorts and dresses, singing stretches of slightly modal melodies in unison. These passages evoke the simple songs of Joan’s youth, refracted through a pungent 1930s musical prism. The cast could not have been better. Christian Gonon, the narrator, also excelled in a range of roles from a herald to a donkey. The soprano Erin Morley brought tenderness to the Virgin. The robust tenor Thomas Blondelle showed diversity as the pig, an officious priest and more. Simone Osborne and Faith Sherman, as two saintly presences, were other standouts among the soloists. Under Mr. Gilbert, the Philharmonic played with glowing sound and rhythmic bite. The performance found a just balance between richness and restraint. Will Mr. Gilbert’s successor bring such a clear artistic and intellectual mission to the Philharmonic? Conductor Alan Gilbert is gifted in the 20th-century repertoire, particularly when it comes to obscure pieces that few other conductors are interested in exploring. Under his leadership, the New York Philharmonic has become adept at staging fully realised, persuasive operatic productions inside the squeezed-for-space confines of Avery Fisher Hall. 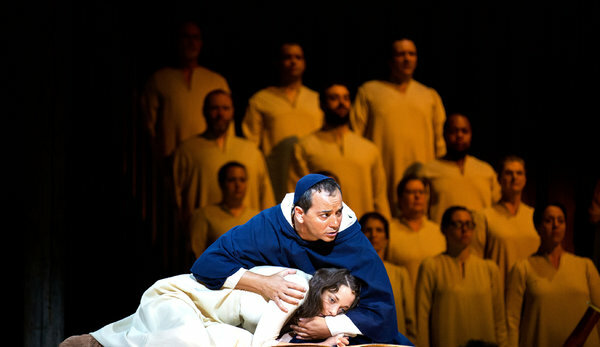 Though in addition to becoming the stuff of New York high-culture legend, the orchestra’s recent productions of stage works by György Ligeti and Leoš Janáček have also set a high bar – one that the organization’s imported, season-closing production of the Arthur Honegger oratorio Joan of Arc at the Stake occasionally had trouble meeting on its premiere on Wednesday night (it runs through 13 June). Gilbert and the orchestra were in typically engaged form, savoring every weird twist of Honegger’s impressively oddball orchestral music (which was written in 1935 and then revised in 1944). When given the appropriate stage space with which to work, the guest star, Oscar-winning actor Marion Cotillard, was frequently magnetic in the spoken part of Joan. The night began and ended well, in large part due to Cotillard’s gripping presence, and her solid interaction with Gilbert, the orchestra and the two choruses on hand (specifically, New York Choral Artists and the Brooklyn Youth Chorus). Early on, Cotillard’s chanting of the epithets used to condemn her – “Heretic! Sorceress! Apostate!”– rested atop the chorus’s recitation of the same words with a ghostly, truly musical power. And whenever Cotillard’s Joan was in dialogue with the character of Brother Dominique – a spectral figure who appears just before her march to the fiery stake, and who prompts the memories that give the oratorio its reverse-chronological, flashback structure – the drama was clear and engaging. Yet for long stretches in the middle of the 80-minute piece, director Côme de Bellescize’s staging seemed like it couldn’t quite figure out how it wanted to approach Honegger’s richly variegated score, which scoops up a variety of early-modernist trends (sometimes smash-cutting between Euro-atonality, earthy folk song and jazz age-inflected strutting in the space of a few seconds). While it’s true that a certain cynicism is afoot, at times, both in the score and in librettist Paul Claudel’s abstracted narrative design – which includes a trial of Joan that is staged by animals (and adjudicated by a pig) – there’s also a heavy moral and religious cast to the proceedings that is, ultimately, meant to be taken seriously. (The Philharmonic’s production even ends with all the members of the chorus and orchestra holding up little candles: a thousand points of Joan-referencing light.) But once you’ve actually put the trial-scene adjudicator in a adult-sized pig costume, and likewise directed the skilled tenor Thomas Blondelle to ham it up to the hilt, it’s a challenge to navigate the proceedings back in the direction of profundity. In a director’s note published in the Philharmonic’s program, De Bellescize admits that a long passage which adduces some obscure history “is hard to understand even for a French audience”. But his cute-overload decision to deck out the Brooklyn Youth Chorus (which sang brilliantly) in brightly colored clothes (and to push them to the front of the stage for the duration of this lengthy scene) seemed an under-thought solution to the dramatic challenge being posed by Honegger and Claudel. And while Comédie-Française member Christian Gonon’s expressions were often good for comic relief (in a sometimes dour work), the great number of characters he had to play, in Joan’s various memories, were not always as distinct from one another as they might have been. Eventually, the oratorio returns Joan to the center of the proceedings and sends her to the fire – and it’s here that this production gets back on track. Joan’s interactions with her patron saints, Marguerite and Catherine, were affecting (and greatly assisted by the fine singing of Simone Osborne and Faith Sherman). At one moment toward the end, as the stage lighting saturated the house in a blood-red tint, Cotillard engaged in a potent bit of physical business – seemingly pushing back against the whole of the auditorium when issuing Joan’s most prideful lines (“It is I who saved France!”), while the chorus called for her to be “consumed by fire”. And even if you know that Gilbert likes to push the Philharmonic to ferocious, brassy extremes (especially in modern music), you still might not be prepared for the thundering climax that the orchestra delivers in this piece. Even if the evening isn’t quite the same sort of unqualified success that the Philharmonic’s previous operatic presentations have primed us to expect, there’s still a lot of power in this presentation of Honegger’s Joan. Until last night Alan Gilbert’s most singular dramatic achievement was his production of Ligeti’s Le Grand Macabre, his superior conducting, his orchestra, his singers diminished only by the cumbersome puppets on stage. In last night’s Jeanne d’Arc au bûcher (Joan of Arc at the Stake), Mr. Gilbert and the New York Philharmonic had no inanimate objects: they had people. Absolutely splendidpeople, splendid voices. Actors and singers from France and America (this had originally been a French production originating in Japan), the New York Choral Artists weaving the most emotional spell from their risers above the orchestra, the equally scintillating Brooklyn Youth Chorus in bipolar roles (first as a herd of sheep, then as medieval children of Lorraine). And most of all, this thrilling, so emotional piece had finest music by that one composer who towered far above those piquant, ironic colleagues of Les Six, Arthur Honegger. A woman sitting next to me asked before the performance what she should listen for (sigh.) I told her just to listen. This was unashamed devotion and emotion. The “dramatic oratorio” had its sarcastic moments, but she would never be puzzled, and she would easily be moved. Honegger famously said that he wanted to please audiences, but never be banal for professional musicians.Jeanne d’Arc could never be banal. I have heard it dozens of times on records, but this was my first staging of the work. And somehow, the staging, the music and the wordsby Paul Claudel always made sense. The staging was mainly with the costumes. The stage itself consisted of two wooden risers with the New York Choral Artists separated, giving space for the different lights. The proscenium was extended, so the actors would strut and fret almost to the audience. On a great platform in the middle of the stage, Joan herself, with her sympathizing (perhaps heretical) friend, Brother Dominique (played with great eloquence by Eric Génovèse). She reviewed her life, was burned, feared, resolved herself and finally died…as she lived…as a child. But the costumes, designed by Colombe Lauriot Prévost, were a joy. We had a heard of sheep baahing and dancing (of course the Brooklyn Youth Chorus), we had the Narrator, dressed as a donkey, an unashamed mugging Christian Gonon. We had the children again, dressed in the most lovely Medieval kids’s clothes, a pastel wonderland. And we had Thomas Blondelle as a wicked priest–and as Porcus the Pig of Pigs!!! What were they doing here? We had the mock trial of Joan (yes, donkey and pig), the recollections of childhood and children’s tunes from Lorraine), we had the priests of the Inquisition. Even the tiny child, Dashel Gossman, as the King, paraded around with a crown. Claudel’s libretto was part devotional, part dramatic, part corrosively sarctastic, part memory, part sacrifice. Was it cohesive? Perhaps not. But Honegger was such a master of taking words and turning them into long melodies, Bach-style counterpoint (and of course that Gallic sense of irony and satire when necessary) that the unity wasn’t as important as the effect. And that effect was given with the mastery of great acting by Marion Cotillard. I once asked Ingrid Bergman what role had given her greatest pleasure. “Not pleasure, but the most emotional experience,” she answered. That was Joan of Arc at the Stake.” One feels that Ms. Cotillard, with her enormous cinematic range, essayed this with all her emotion readily naked for us to hear. Not peacefully. Not like a saint. But in Claudel’s most brilliant moment, refusing to free herself from her chains. “The chains are love…and hope…” she cried. The whole piece, lasting less than 80 minutes, has the sweep, the cinematic sweep where scenes change suddenly, actors mime, play cards, march about the stage, and yet we come back to Ms. Cotillard, the cynosure. She and the New York Philharmonic. Wisely, though this was a drama of sorts, the orchestra was on the level as the actors and singers, for Honegger’s mastery of orchestral effects couldn’t be concealed. Alan Gilbert seems to relish these large-scale performances. With the same momentum that he can gone through the surrealistic Le Grand Macabre, he swept through the fierce excitement here. Ms. Cotillard never made her a Saint. She was a creature of feeling, and whether the feeling was terror or joy, Honegger made that feeling its own reward. The fact that Mr. Gilbert took on this production never could give us the same sacred feeling, but we were rewarded. Not with the spirituality for which the nuns were searching, but with a visceral sense of poignancy and, yes, joy.